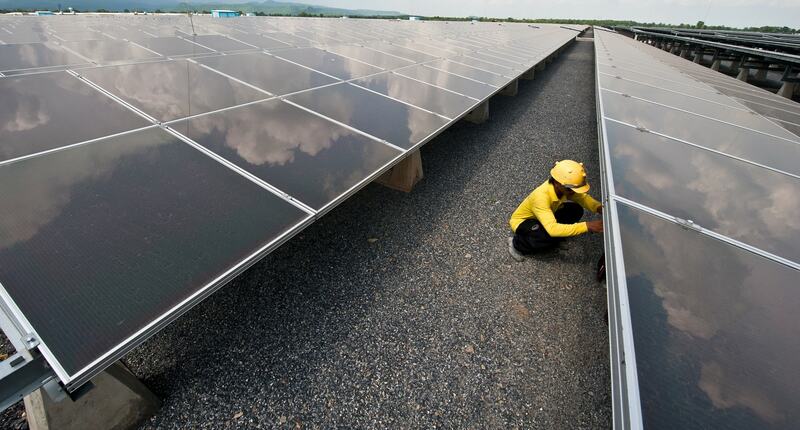 Southeast Asian governments are starting to wake up to the vast potential of solar energy, under pressure from civil society groups that insist it is time to get on board with a global revolution in renewable energy. They should also ensure that the urge to adopt coal and hydropower does not make them overlook the importance of renewable and green technologies. Rapid renewable energy expansion will not just provide diversity to the energy mix for Southeast Asian nations, but is also a vital strategy for coping with climate change. Recent increases in the intensity of droughts and floods are a reminder of the region's perilous condition. All ASEAN countries have pledged to reduce carbon emissions by the year 2025, but continued reliance on fossil fuels and hydro-power (which produces methane gases) will make it impossible for these countries to achieve their targets for reducing greenhouse gas emissions. Many in the world are lagging on green energy, and yet since 2010 wind and solar power generation has grown to a total of 313,000 megawatts globally, almost four times faster than large hydropower plants in the same period. This global change has lessons for Southeast Asia, especially the countries joined by the Mekong River, the world's greatest inland fishery and a crucial source of food security. Cambodia, Myanmar and Vietnam especially are plagued by inefficient national electricity grids dependent on coal and hydropower, delivering high-priced but erratic supply. The Mekong has too many dams for electricity generation and has suffered rapid depletion of nutrient-rich sediment, making a switch from hydropower to solar power an urgent necessity. The Cambodian government could achieve electricity self-sufficiency through the development of solar energy within 12 months under the right conditions. According to the Asian Development Bank, one Cambodian solar farm in Bavet in Svay Rieng province is now able to meet about 25% of the local electricity demand in the town. The ADB reports the project will help reduce greenhouse gas emissions by 5500 metric tons of carbon dioxide equivalent annually, as well as creating jobs for the local community. This should serve as a wake-up call. At present, solar development currently plays a negligible role in the Cambodia's energy strategy and is absent from the government's forecast for electricity supply up to 2030. Many potential investors are concerned about the significant challenges in scaling up solar, particularly around licensing, access to long-term debt financing, grid integration and national legislation. But analysts are hopeful things are about to change. Brian Eyler, a specialist on Mekong energy production and Director of the Southeast Asia Program at the US-based Stimson Center, told me that 2018 will bring a 'sea change' for renewable energy investment in the region. Thailand is one country with a national grid with few disruptions and has developed a regulatory framework for renewables. It has permitted the development of off-grid solar farms for 'small power producers' that allows mini-grids to sell electricity to the national grid at standardised rates. The program has enabled over 3,000 megawatts of small-scale renewables to come online, the same generating capacity as three large nuclear power plants, according to a recent Reuters report. If the next dam on the Mekong, the Pak Beng dam [in Laos], is launched in 2018, then by the time the dam is completed in five to seven years time, it will already have become obsolete. The steps being taken by regional governments so far are incremental and complementary, rather than efforts to replace existing contracts for coal and hydropower. China's role in the lower Mekong countries has been a major factor in the promotion of hydro-power dams in Laos, Cambodia and Myanmar. However, China is not only the world's biggest dam-builder; it is also the largest producer of solar panels. If the region is to get serious about solar, the most realistic option is for countries in the lower Mekong region is to begin negotiations on deals with Chinese companies for renewable energy production, and to protect two of the most important rivers in the region, the Mekong and the Salween. Obsolete technology should be replaced with renewable energy to harmonise three essential goals: the supply of electricity, flow of healthy rivers, and fighting climate change. The case for openness is compelling, but also more nuanced than many proponents tend to make it.